Infographic: The Past and Future of Drones in the U.S. I would add one thing here: the 1985 MOVE bombing by police in Philadelphia. By anyone’s reckoning, the members of the MOVE commune were a very bad bunch. However, nothing they did justified the response by Philadelphia police. When Philly’s Phinest decided they had had enough, they called in the Pennsylvania State Police, who dropped 2 bombs from a helicopter. 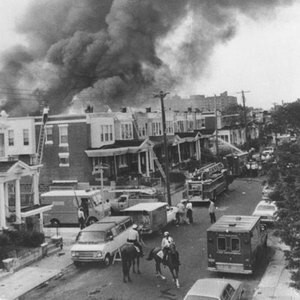 The ensuing fire killed 11 people, including 5 children, and destroyed 60 homes. We hear about this frequently in the Middle East, where America justifies drones that drop bombs that kill dozens of people and inflict massive collateral damage in order “to get the bad guy.” If they will do it in Yemen, why wouldn’t they do it here at home? Also, please read how drones have been used in domestic law enforcement against a rancher in North Dakota. This is a very informative graphic. It was originally posted here. This entry was posted in Uncategorized and tagged drones, history, move, north dakota, philadelphia, rodney brossart. Bookmark the permalink. 1 Response to Infographic: The Past and Future of Drones in the U.S.